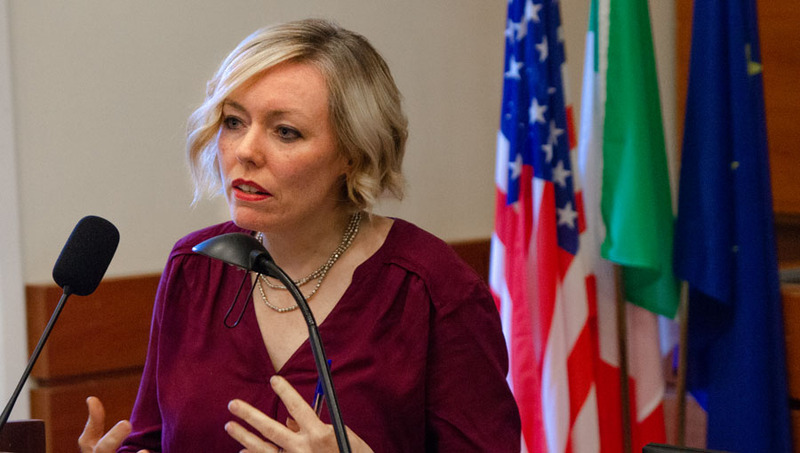 On March 2, the JCU International Affairs Society welcomed Political Science professors Jackie Norris and Diane Maye for a discussion of the results of the March 1 presidential primaries. While primary elections to select presidential candidates are held from February through June, “Super Tuesday” refers to the day when the greatest number of states hold primary elections and caucuses. For this reason, “Super Tuesday” typically represents an important test of a candidate’s national electability. The event, which was moderated by IFS Vice President Mihail Iotov, took place in a full Aula Magna Regina. Prof. Norris, whose long career in politics and public affairs includes serving as Assistant to President Barack Obama and Chief of Staff to First Lady Michelle Obama, currently teaches American Government at JCU. She kicked off the discussion by offering an explanation of how the primary process works and said that it appears very clear after “Super Tuesday” that the winners are Hillary Clinton and Donald Trump. She remarked that this election has two very important firsts: Clinton is the first woman likely to clinch the nomination, while Trump would be the first CEO, the first person completely outside of politics, to seemingly secure the nomination for one of the two major political parties. She added that there is a great hunger for an outside candidate, which explains the enormous popularity of Bernie Sanders, who is viewed as being independent of the political establishment. Prof. Diane Maye, a visiting professor from George Mason University in Virginia, is teaching Introduction to Political Science, World Politics, and American Foreign Policy this term. She framed the discussion in terms of foreign policy issues and said that Donald Trump’s aggressive, far-right rhetoric has really touched a nerve in many voters. It is no surprise, according to Maye, that he was recently endorsed by Jean-Marie Le Pen, founder of France’s extremist National Front. She noted that Trump, the embodiment of American capitalism, is pretty much the diametrical opposite of Sanders, who describes himself as a socialist. While Prof. Maye is not so sure that Sanders is out of the race, she concurred that it appears likely that Clinton will win the Democratic nomination. She too stressed the trust factor and predicted that the Republican candidate will surely bring up controversial episodes from Clinton’s role as Obama’s secretary of state, in order to question how she could possibly be trusted as commander-in-chief. Both speakers concurred that the contest will become very interesting in the coming months, when the Democratic and Republican candidates battle it out for the “swing states,” which cannot be relied upon to vote definitively one way or the other.